With spectacular sea views, this property is located in the prestigious area of Los Monteros in East Marbella and is situated at a mere 5-10 minutes drive into Marbella and Puerto Banus. The villa is mainly on one level, arranged around an interior Arabesque style courtyard with a fountain, palm trees and a covered gallery. Villa Melendez is divided into 2 areas: the prime living space in the southern part and the guest quarters in the northern part. As well as the main living areas, there is an indoor heated pool, a gym and a TV/cinema room. There is also a gourmet style kitchen and formal and informal dining rooms opening on to a lovely covered terrace leading to the pool area. The guest quarters can be accessed from the courtyard and comprise 2 bedroom suites, 2 further bedrooms en-suite with bathrooms and a self-contained staff apartment. There is a tower with a guest en-suite bedroom and access to a large chill-out terrace enjoying fabulous sea views. Externally, there are lovely tropical gardens with a large pool, gazebo, and a covered BBQ area with sitting and dining areas, and direct access to the beach. 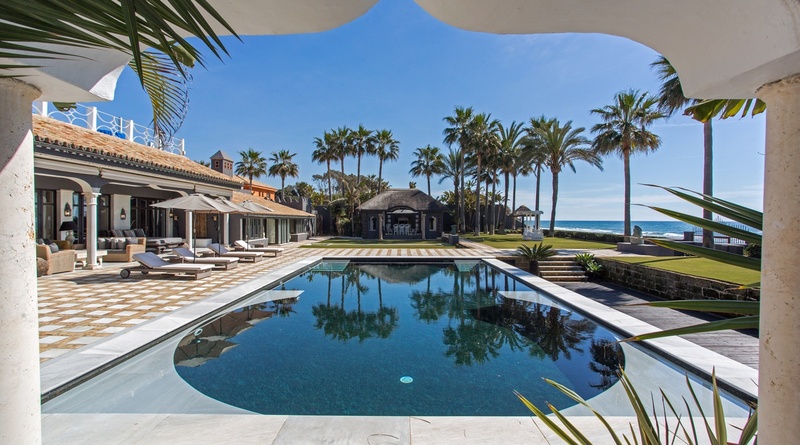 Villa Melendez is a truly unique property located in one of Marbella´s best areas and on one of the best beaches. This villa is covered by 24/7 concierge service.